Product code: Q867 Categories: Sold Items, Sold Jewellery. Here is a magnificent antique necklace made by one of Australia’s most influential early jewellers that is also complete with its original velvet lined fitted box. 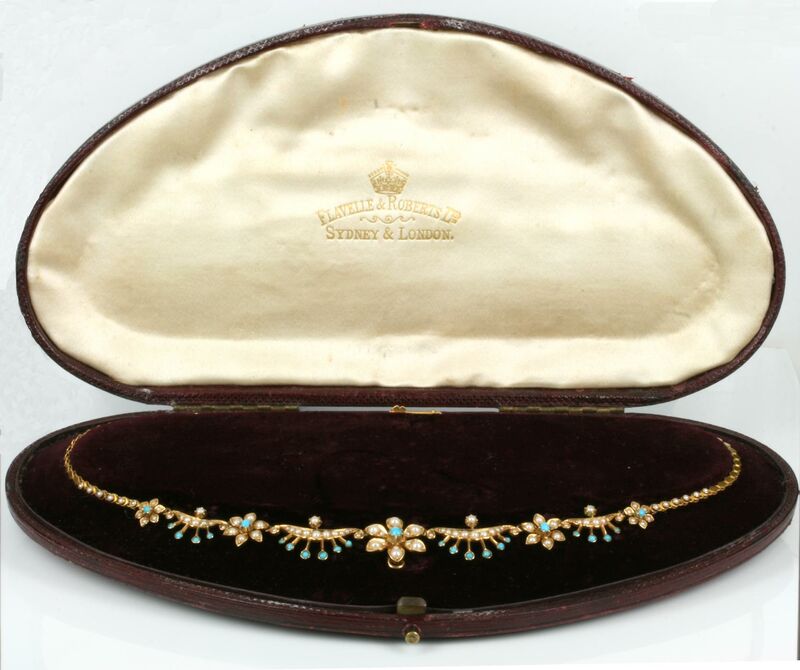 Made by Flavelle and Roberts around 1895, the necklace is made in 15ct gold and set with pearls and turquoise in the most elegant and beautiful design. Laid out flat, the necklace measures 40cm in length and from the end of one flower cluster at one to the other it measures 13.3cm. with 5 clusters with the most elegant crescent shape between. In total there are 25 pieces of natural turquoise and a staggering 88 seed pearls so beautifully graduating in size. This antique necklace sits so well on the neck and really makes such an elegant statement day or night and is made all the more special by having its original fitted box. Flavelle and Roberts produced some spectacular jeweller and this antique necklace by them is most certainly no exception.